DCU Classics Series 18 is full of homages to the Superfriends - and it's not just limited to the heroes. Yes, that's all true - it just has nothing to do with this figure. That bio describes the original Toyman, who was created in Action Comics #64 back in 1943; but the toy depicts the second Toyman, Jack Nimball, who debuted 368 months later in Action Comics #432. He took over the name when Schott had apparently retired. Nimball's career was short-lived, though, because less than three years later Winslow came by and murdered him. That was two years before Challenge of the Super Friends aired, but it was still the Nimball design that made it to animation. 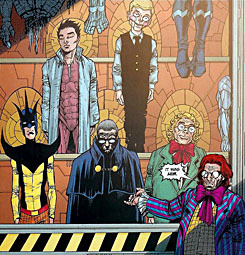 The first Toyman dressed like a turn-of-the-century dandy. He had curly blonde hair done up in ringlets and eyebrows like two vast caterpillars mounted on his forehead. Think of an adult version of Little Lord Fauntleroy. Which I suppose would make him Big Lord Fauntleroy. Anyway, the second version dressed like a jester. His hat has the traditional three points, though rather than being floppy, they stick up like a crown. His face is narrow, and he's showing his teeth in a thin smile. Toyman uses the same basic body as The Creeper - it's long and lean and almost inhuman in its proportions. Of course, he doesn't have the fur trim on the gloves or boots, so those come from Deadman. As you can tell, the black costume element on his shoulders is a new, separate piece. It plugs into the capehole in his back, but is otherwise free-floating: there's no glue to hold it to his chest or shoulders; and that's fine, because just attaching at the back is enough to keep it from flopping around. The collar has a really nice sculpt, if you examine it closely. There's a hemline running all around the edge, with small wrinkles where the "cloth" has been bunched up. Though this design originated in the comics, it was tweaked slightly when it went to the cartoon. The biggest difference? His legs were solid orange, instead of covered in hard-to-animate vertical black stripes. This toy follows the animation, because the same lines that were hard to animate were also hard to paint; why pay for those extra apps when you can reasonably skip them? Both the comics and the cartoon made the top of Toyman's hat the same blue as his boots, but the toy just gets a light airbrushing of the color up there, not full coverage. Since Mattel didn't fritter away money on painting the legs, there was room in the budget to give Toyman some accessories - naturally, they're toys. There's a top with a fuse(?) sticking out of the handle, and a yo-yo with spikes around the edges. Contrary to urban legend, yo-yos were never used as weapons: they've always been toys, and are at least 2,500 years old. But this one's a weapon. It has a real string, tied both to the yo-yo and to the silver handle that fits onto Toyman's hand. You can wind the string, but don't expect the accessory to actually work like a yo-yo. Toyman's part of the Series 18 Build-A-Figure is the right arm - so unless you want Apache Chief to be lopsided, you're going to need it. The upper arm is shared with Atom Smasher and Trigon, but the lower arm is new, since it needed a simpler wristband. 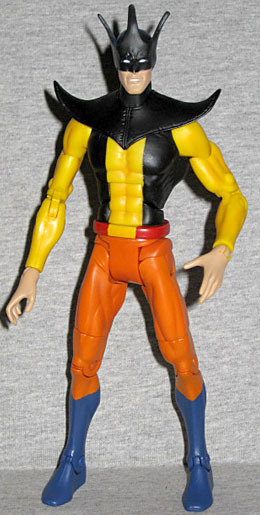 The Jack Nimball version of Toyman only ever appeared pre-Crisis. But Goeff Johns, in his drive to fix everything that's wrong with comics (ie, do whatever nonsensical thing it takes to return the stories and characters to what they were when he was a kid), gave us at least a glimpse of the character. In an issue that existed for no reason but to excuse Winslow Schott's murder of a child, Schott revealed that he'd been in hiding for years, using robots that were so sophisticated that they could even fool Superman. FOOL. SUPERMAN. How do you fool a guy who can read DNA from across the room and hear heartbeats around the world? Lex Luthor can't even build robots that do that. So stupid. Anyway, among the robots are Hiro Okamura (the new Toyman from Superman/Batman), the giant-headed DCAU Toyman, and even this version. So, you can make this figure represent the actual comic character, the cartoon character, or the robotic duplicate - however you style your collection, there will be a space for him.